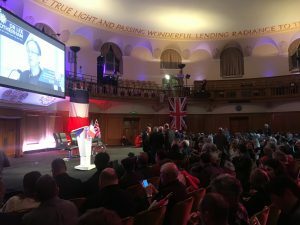 On the 29th of March Church House Westminster was the venue for a celebration of Brexit held by Union Populaire Republicaine, a French political party who support Frances withdrawal from the EU. A full house of 650 guests travelled from France in support of Britain’s exit from the EU. The fact that Brexit didn’t actually take place on the planned date did nothing to dampen the enthusiasm of the energetic, partisan audience, who cheered every speech with chants of Brexit, Brexit, Brexit! Followed by an even louder chorus of Frexit, Frexit, Frexit! Every guest was issued with a selection of flags on arrival, including Union Jacks, the French national flag and of course Brexit and Frexit pennants. They also received headphones in order to receive live translations of speeches delivered in English, all of which helped create a loud, colourful, good natured atmosphere within the venues largest room, The Assembly Hall. The next challenge was to feed 650 very hungry French nationals within the allotted 45-minute break! So, in keeping with the theme of the evening a bowl food menu was created including such French classics as Bangers & Mash and Fish & chips! All washed down by large quantities of French wine. Refuelled and raring to go the speeches continued through to midnight when the evening was concluded with a rousing rendition of God Save the Queen, including two additional verses our General Manager hadn’t heard since he was a boy scout! And an equally rousing version of “La Marseillaise”. As guests departed the Assembly Hall, they were handed a glass of Brexit-branded Champagne, imported especially to toast the event that never happened! “We look forward to welcoming them back, in fact if they decide to do this every time we hit a Brexit deadline they could become a very regular repeat client!”, Robin Parker, General Manager of Church House Westminster remarked, with tongue firmly in-cheek. “Westminster is certainly an interesting place to be located at the moment, and business could be described as a bit of a roller coaster, if so, this interesting, good natured event was certainly one of the ups, whatever your political views.